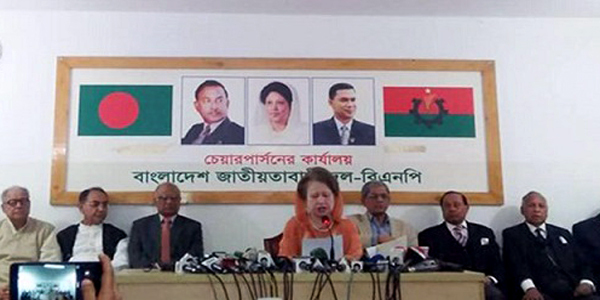 Dhaka – Bangladesh Nationalist Party chief Khaleda Zia has expressed doubtfulness whether she would get justice as a court is set to pronounce verdict Thursday in one of the graft cases she has been facing. Khaleda, a former prime minister, claimed at a press conference Wednesday, a day ahead of the verdict, that she was implicated in a false case. “I believe, the court will acquit me of all charges,” she told reporters adding that she was ready to accept any situation as the government was trying to keep her away from politics. A special court in Dhaka is scheduled to pronounce verdict in the Zia Orphanage Trust case on Thursday. Khaleda, her eldest son Tarique Rahman and four others were charged for embezzling 21 million taka which was meant for the welfare of the orphans. The Anti Corruption Commission filed the case on July 3, 2008. The former prime minister would be sentenced up to life in prison if found guilty. Conviction in the graft case would also cause her to be disqualified from contesting the next parliamentary election due by at the end of the year. The BNP chief accused the government of hatching conspiracy against her party. She said the ruling quarter has been carrying out a reign of terror across the country ahead of the verdict. “I will not bow down my head. I am ready to face any situation,” said Khaleda, who appeared as an ‘uncompromising’ leader during the anti-Ershad actions during the late 1980s. The judgment is going to be announced as per the will of the government, she said. Khaleda urged the government to shun the path of violence calling for holding a free, fair and peaceful election through dialogue. “We still believe that a good sense would prevail upon the ruling Awami League,” Khaleda said pointing the Prime Minister Sheikh Hasina, her arch political rival. The government has tightened security across Bangladesh to prevent possible troubles ahead of a verdict as the BNP earlier threatened to take to the street if the verdict goes against the party chief. Additional check points have been set up in the capital to ensure city-dwellers’ safety, Asaduzzaman Mia, police chief in Dhaka, said a day after the authorities imposed ban on processions and rallies until further notice. Carrying firearms or any other sharp weapons, explosives or inflammable substance have also been prohibited. In Dhaka, police are seen checking vehicles at different places to avert possible troubles. Check posts were also set up at the major entry points to Dhaka. Almost similar measures have been taken up in northern and central districts.